It’s a cold January day, with a forecast of *S*N*O*W* for Alabama — an almost unheard of event. 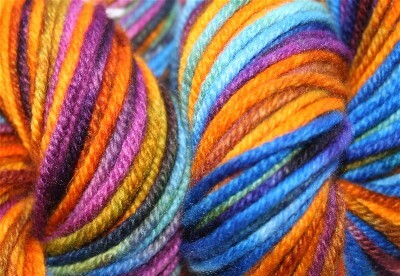 I thought I would give you a sneak peak of the new colorways in my dyepots, to help warm up your day. Does that sound like fun? There are a few that I have been dyeing up batches of and haven’t offered anywhere yet. 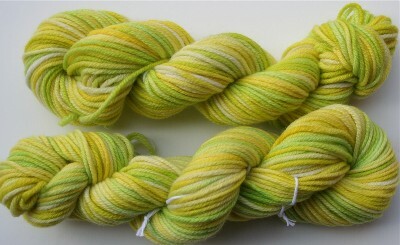 They include Jonquil, pictured here on cashmere. 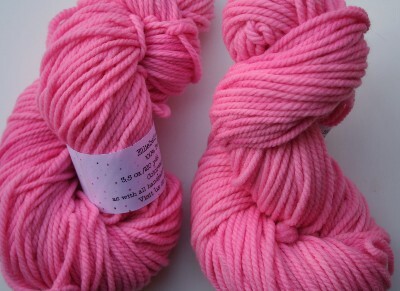 I’m in love with cashmere right now and have kilos coming in. I’m afraid this late evening photo doesn’t capture the sheen and depth of this colorway, but Ellie pronounced it her all time favorite, which is saying quite a lot. 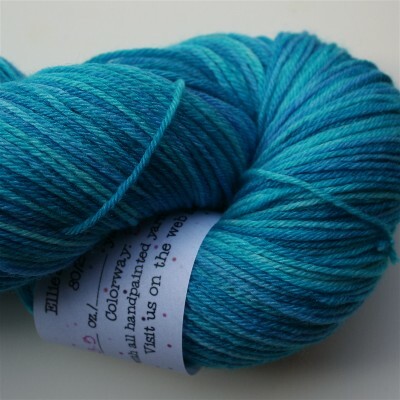 Pictured here on a bamboo blend sock yarn. This is Pellucidly. I had to look that word up when I came across it in a recent Supreme Court opinion. It describes this yarn pefectly. I love pink. Girly-girl pink. So I decided to do an almost solid pink for spring. This has some very gentle, subtle color transitions, and knits up into a really nice, makes the light around you look beautiful, not quite solid color. Its called Pink Love. 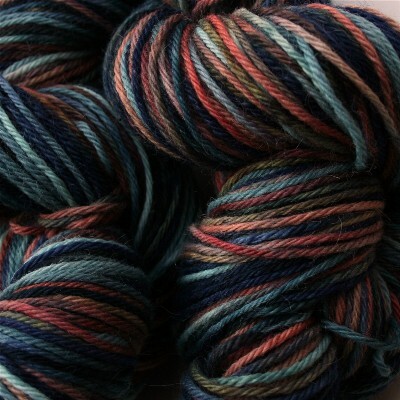 And, because every family in the South has one, this is renegade, on a wonderful Alpaca/Merino blend. 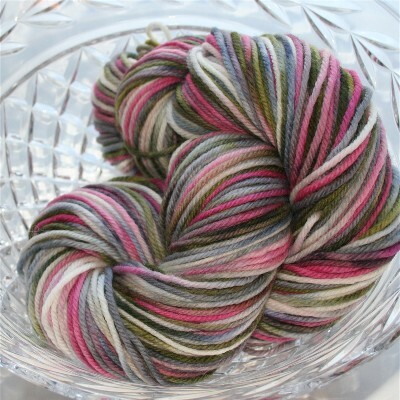 There are also a couple of colorways that I have already previewed. 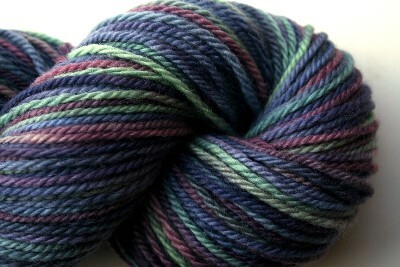 Katie is the most popular new colorway since Treasure premiered. I find that the feminine but not-too-girly Katie looks fabulous on every single fiber I have tried it out on! Finally, there is Satellite, a Mardi-gras riot of welcome to spring colors. *Sigh* I love them all. Dyeing is an awful lot of fun. And now, here is a surprise. I no longer am able to do custom orders because of the whole volume thing. But I’m in love with these new colorways and thought it would be fun to offer a few customs, say five of them (maybe a few more or less depending on the number of skeins in each order). So, if you want a custom order, be one of the first five people to email me at Joyce at Elliebelly dot com. You can pick any of these colorways on any of my instock fibers, which currently include, well, a whole lot. Cashmere, Silk, Blue Faced Leicester, Merino, Organic Merino, Alpaca, Bamboo, and more. I will also be happy to do solid trim skeins for you along with a custom. The only catch is that it will likely be February before customs go out — certainly no later than mid-February. If you’re interested, just let me know. *faint*. Jonquil is just stunning. I am seriously in love. I find myself drawn to colors in your work that I don’t usually identify as favorites… and I have to admit, I love getting out of my box :). They are all so beautiful there is no way for me to pick a favorite. Love, love, love jonquil and Pelluicidly. Those are just stunning! Satellite is fun, funky, and downright cool! so very pretty that I almost forgot to ask–when do we get to see pictures of your library exhibit?? fingers crossed that y’all will get a little snow! Jonquil and Satellite are my favorites!!! Such yummy, yummy yarns!! !